Complimentary valet parking available as well as self parking on site. Contact our sales manager Tali Schinnar - Mazzola at (571) 510-3176 or tali@eddiemerlots.com for information on Special Events and Private Dining information. Contact our sales manager for information on our off-site catering. Eddie Merlot's Prime Aged Beef and Seafood starts with U.S.D.A. Prime Beef. Only 2% of all U.S. beef is awarded this superior certification. 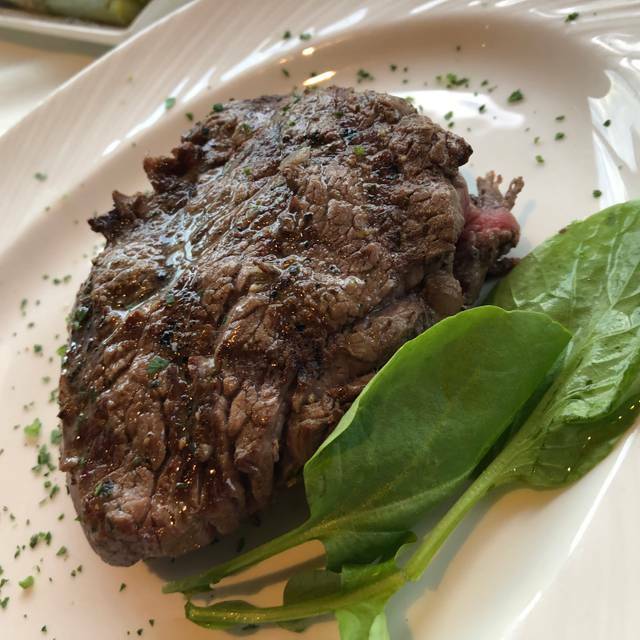 Eddie Merlot’s ages the beef naturally to an unparalleled standard of tenderness and flavor. The chef then personally selects each piece for the optimum proportion of marbling, and texture, before hand-cutting and seasoning the thick, tender, and juicy steaks to your specifications. To seal in the flavor, the steak is flash-sear on high-heat grills. 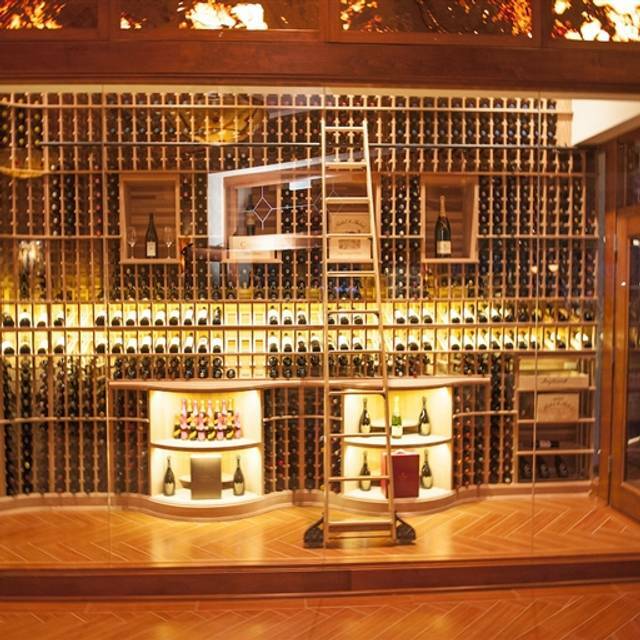 Eddie Merlot’s has created one of the hottest concepts today; the wine bar provides more than 40 wines by the glass and a very extensive reserve wine collection by the bottle. The bar is stocked with all of the finest spirits and after dinner cordials and Cognacs. Eddie Merlot’s boasts a contemporary but stunningly elegant interior design and atmosphere—where guests can have fun, relax and enjoy listening to up-tempo music, while dressed in business or casual attire. This Mother’s Day treat the mom in your life to an exceptional brunch! Enjoy mouth-watering meats at our carving station, make a seafood selection at our fresh shellfish bar, savor hot buffet items with a variety of options, as well as a made to order omelet station, there's something for everyone! Our waiter was probably the best I’ve ever had. Extremely knowledgeable, helpful, professional and attentive. Birthday celebration dinner was amazing! Off the charts food and service! As usual the service and ambiance was super. My steak was excellent. Regrettably, my wife’s red snapper was a little dry - she’s more used to the Bobby Flay version. Overall, and despite having a number of other good choices in the Ashburn area, Eddie Merlot remains my go-to choice in the neighborhood. Although we went for dinner, I’d like to add my appreciation for the bar service and menu. Unequaled in our area! Had the all you can eat king crab legs. They were awesome. And three desserts. Great time with friends. Food was very good though not inexpensive. Our waiter was very helpful and attentive. It was a lovely evening celebrating a friend's birthday. We always have a great meal. Keith was an amazing server, made my husbands birthday dinner so special! Great experience. Food was a ten. And service was outstanding. Forgot my servers name but she was dynamite! We liked it but prefer DC Prime and Ruth Chris. Will definitely go again! Great service, oh my gosh the bacon ! Thank you for a lovely Anniversary Dinner. We made last-minute reservations for my birthday dinner on a Saturday night and EM’s was wonderfully accommodating to us. My boyfriend and I loved everything about the place! It’s beautiful, well-lit, tastefully and artfully decorated, the music sensational, the ambiance and energy were just incredible. The food...OMG...After eating Wagyu beef, how will we ever eat another regular steak, again?! It melted in our mouths...Our server was PHENOMENAL. His name was CHRIS and he’s definitely a top-notch, world-class, hospitality professional. He even gave me a birthday card. We’d return to EM’s just to see Chris even if the food had been less than AMAZING. One of the best dining experiences we’ve ever had. Thank you, Eddie Merlot’s! Katie the waitress was fantastic! We had king crab legs. Some were hot and some were room temperature. The sweet and spicy shrimp was very good. Waitress Britney was very friendly and helpful, excellent service. Manger Kurt was relevant and friendly. When it comes to food I am very difficult person to please. I order Chefs File de Mar. Not Happy with it, It was less than my expectations. We're so glad we chose Eddie Merlot's for our anniversary dinner. The ambience is warm and inviting, the perfect setting for our dinner celebration. The table service is impeccable, nothing is rushed. The skilled servers are friendly, and true professionals. Tim, our server was highly professional, and a pleasure to chat with. He answered our questions about wine selection and entree options in a bright, conversational manner. The food is absolutely superb! The bourbon brown sugar ribeye was masterfully presented, and the most delicious piece of beef my wife and I have had in years. We highly recommend Eddie Merlot's for celebration dinners, or any fine dining event. Went here for my birthday. 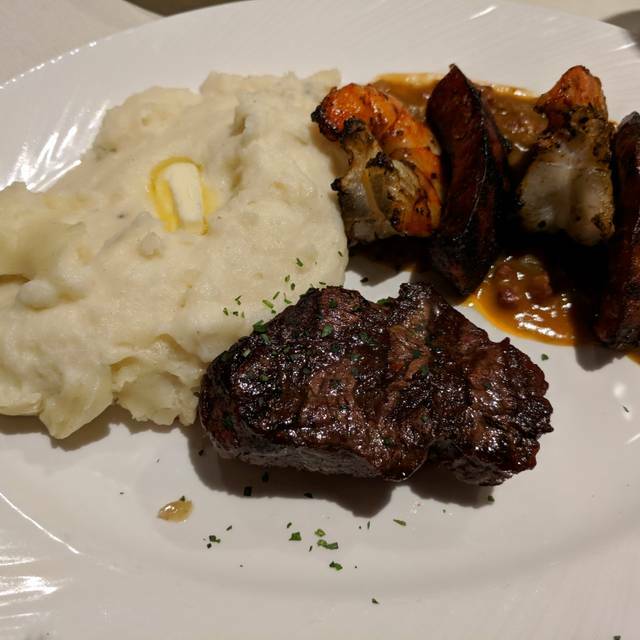 Decided to get two entree’s as I wanted the wagyu, but the shrimp and scallops sounded good too. Both were excellent but the steak was out of this world. Great atmosphere and staff too. We had reservations but were told it would be at least 30 minutes. We then sat at a nice table in the bar area but it was very noisy. Waitress even had a hard time hearing. Waitress was very nice and attentive. We Then had to wait at least 20 minutes for our cocktails to arrive. Dinners were ok. 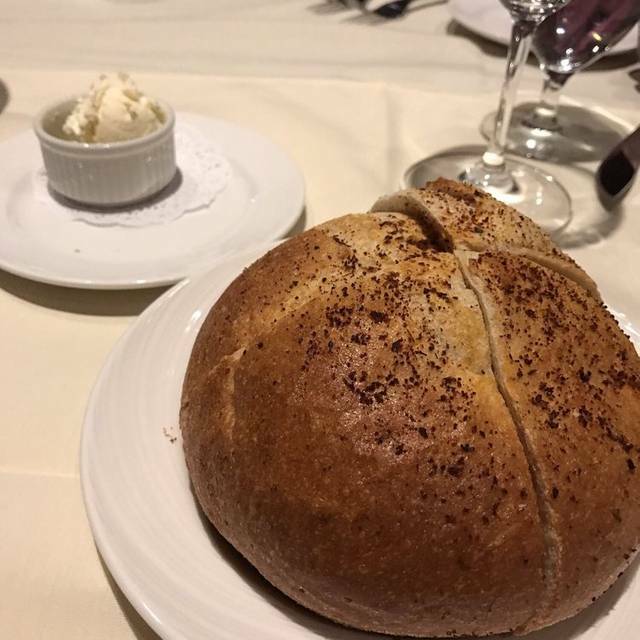 Bread salad and dessert were good. Good company made it a nice evening. Dinner was delicious and our server was great. What happened? Eddies used to be awesome. Now it's just OK and for the price, not worth it. The raw material of the food is good quality. But what they do to it during the cooking process is just ordinary. If I'm going to pay $50 for a steak, it had better be awesome. It isn't. The mixed salad is really ordinary. Some wilted lettuce and a few tomatoes and a sprinkling of cheese for $10. Naah. The deserts are huge. But again, just ordinary. We took the rest of the chocolate cake home. Later we heated it a little to see if it got better. It didn't. We threw the rest out. The service is a little clueless. If asked what ingredients are in a dish, "I don't know" is not an acceptable answer. Go find out. We might go back in a few months. For now, there's better food in the area for a lot less money. Overall I liked the restaurant and the food is excellent. I do want to say one thing, if you are expecting to get there and eat within an hour or so, this is not the place. Our dinner took about two and a half hours. The slower pace is nice but does give you the chance to over eat 😉. I do recommend their ribeye, it literally melted in my mouth and their bananas foster, which is made table side, is fantastic !!! We will definitely go there again for dinner or even drinks and dessert. Waitress said she was offended. We to this day do not know what she was talking about. Great steaks, awesome atmosphere and the best sweet potato casserole ever. I highly recommend Eddie Merlots for romantic dates, anniversaries and birthdays. Enjoy. Service was good. We were there to celebrate my wife's birthday. It was our first visit. The reason I call it a "mixed experience" was because my wife ordered a Filet Mignon that was to be cooked medium well. I know, not a kind thing to do to a good steak, but she's ok with a little pink. I ordered a NY Strip done medium. Her steak came out, and it was barely to the medium level, almost rare. Mine was just a touch overdone, but quite good all the same. We had to send her plate back, and our server was not where we could wave him over, after he initially dropped our food off. A couple of minutes went by, and a manager saw us and noticed we needed help. She quickly stepped in, taking the Filet back after we explained. Meanwhile, being polite, I waited while my meal cooled. This was unfortunate, since the manager really stepped up, and the service was actually pretty good. We still enjoyed ourself, just expect just a bit more. It was clear our waitress was fairly new, however she had a darling personality and overall did a good job. Our disappointments did not stem from her service. To start we requested the blue cheese chips that are served in the bar for an appetizer and she managed to serve them to us in the dining room which was appreciated. I was craving them but they were a huge disappointment and no where closet to as good as the first time we had them. There was barely any sauce/cheese on them and the sauce was lacking flavor. You could not tell it was blue cheese at all! Most of the chips were eaten without any sauce on them. A pretty expensive bowl of chips at $9.95!!! All three of us ordered the scallops which were pretty disappointing as well. The accompaniments were so much better than the actual scallops. They were WAY over salted and this is coming from someone who LOVES her salt! It really ruined it for me. 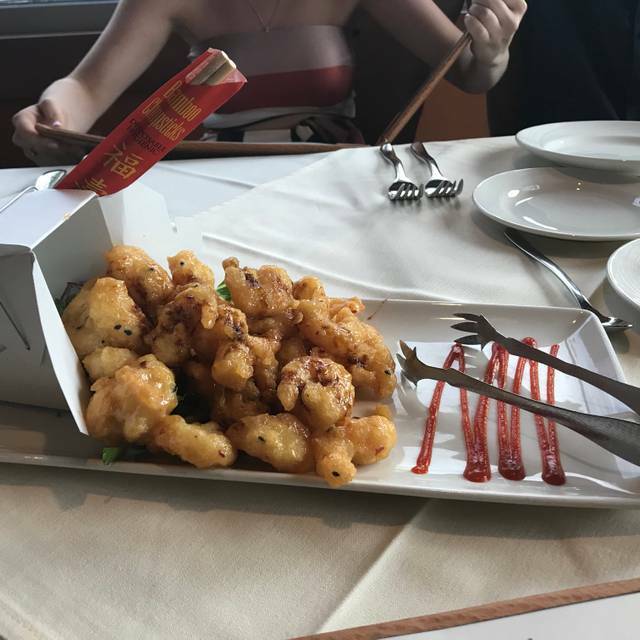 We also ordered a side of broccoli for the table which never came. 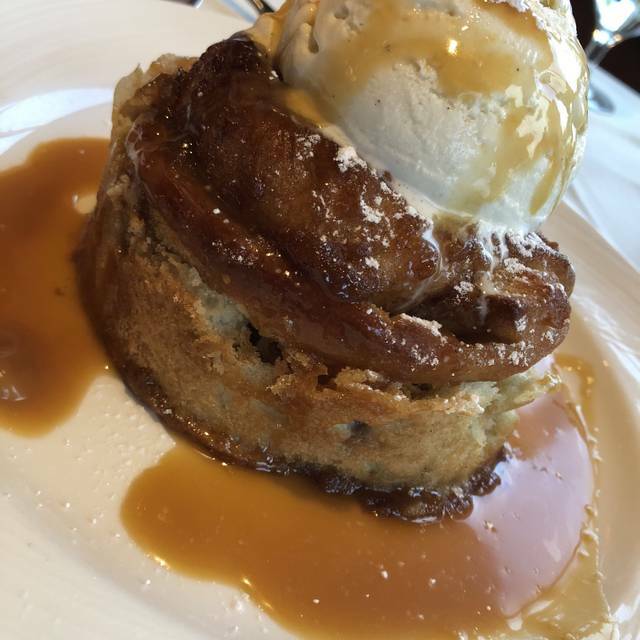 We ended our dinner with the bananas foster which was very delicious. Overall not a great value. very disappointing went for a birthday celebration and could not get order right or steak prepared correctly. We love this place. It's such a beautiful restaurant and the food and service are always good. We love the fact that they change up their menu with the seasons and usually have different specials. 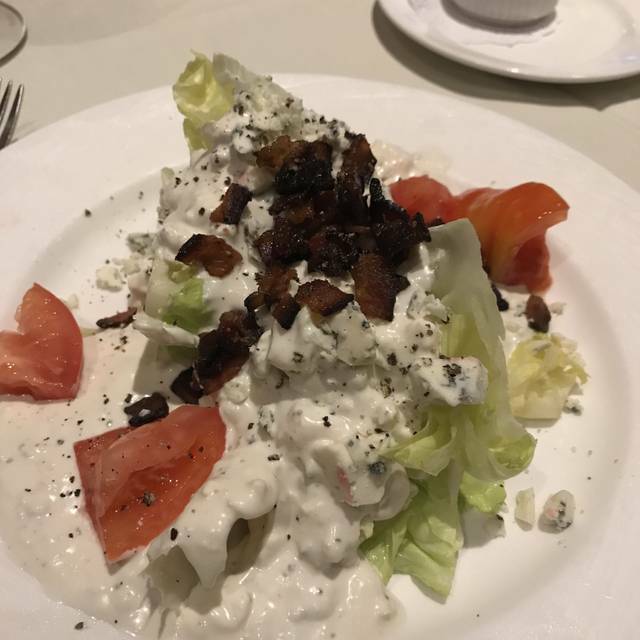 This was the first time that I had their "wedge" salad and it was delicious. Very fresh with lots of smoky bacon and the dressing was perfect. Very friendly staff. Great options. Been there with my wife and kids. Great options and ambiance for a family dinner or an adult date night. Thrilled they are nearby. Service was poor. I was seated for over two hours and only received one drink refill. It was overly noisy and after mentioning such, nothing was done to remedy it. I even had to have the waiter speak up and repeat what he was saying when taking our order. The side dishes were served cold and the chicken dish was overly tough requiring it be cut with a knife. The French press was too full of coffee grinds resulting in a cup full of grounds when poured. Overall not a very good experience for price. The steaks were great; fixed exactly the way we ordered! 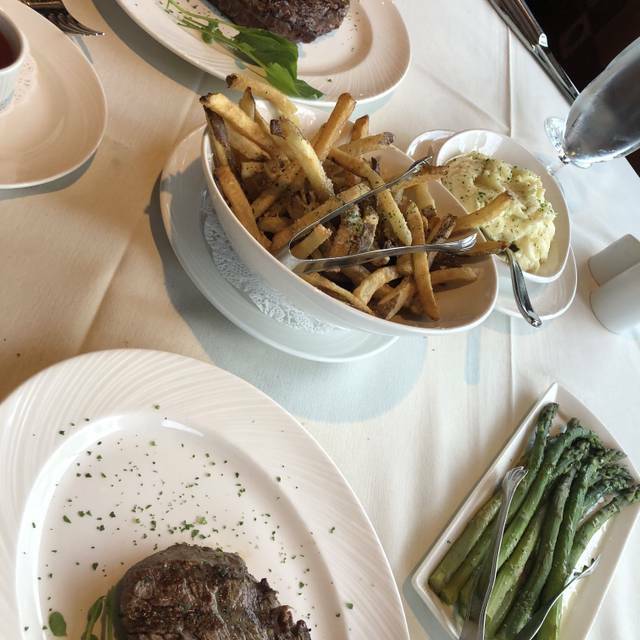 Truffle fries and asparagus were good, although way too much. The crème brûlée was delicious. I would appreciate a better choice of moscato other than d’asti. Our server, Cassie, I think, was fabulous. She made the whole dinner experience VERY enjoyable. Price was high, but expected. We probably would only return for very special occasions. 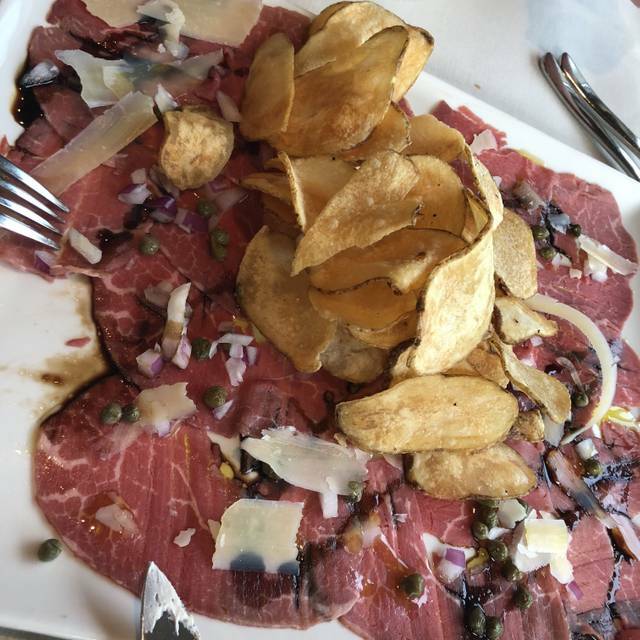 Fabulous food and service and lovely upscale atmosphere - a real gem in Ashburn! The ambience was very nice, and our waitress was AMAZING! Like imagine Nordstrom’s model customer service and then inject that image with steroids and that’s how good our waitress was! The steak melted in our mouths - oh the Lobster Bisque, mmmmmm! Can’t wait to go back again! Food and service were great, we will return! The only downside would be that we were seated at a table for two right behind the entrance and it was cold that night, every time the doors opened we would catch the draught.